It’s far warmer than usual, I’m told, but even at the height of summer there’s the cooling presence of a sheer caressing breeze. The sun beams brilliantly in the pure blue sky, illuminating the rich and vibrant colours of my surroundings; the olive green palm trees, the emerald lawns, the citrus hued flora and the dusky coral casitas. 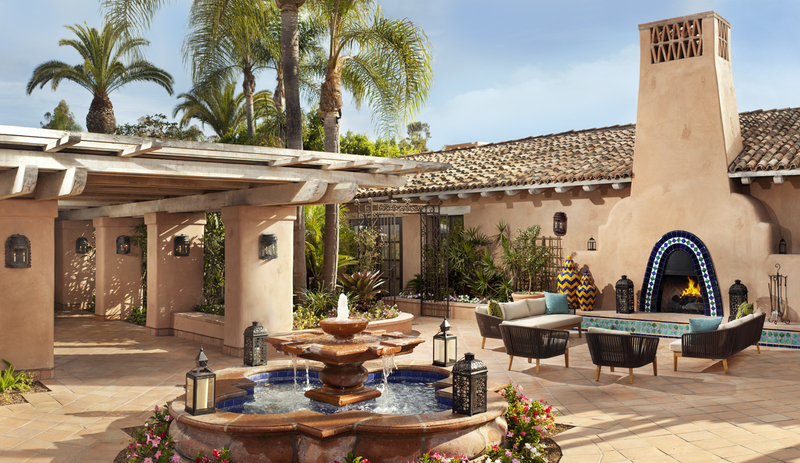 The sun-drenched scene is suggestive of Mediterranean vistas, but this particular imagery belongs to the Rancho Valencia Resort & Spa in Southern California. Located in the coveted neighborhood of Rancho Santa Fe, just 90 miles from Los Angeles, 30 minutes from downtown San Diego and a short drive from Del Mar and La Jolla, Rancho Valencia has reaped the favour of many a celebrity, including Bill Gates, Michael Jordan and Bill Clinton and boasts an esteemed reputation in the world of luxury resorts. And it’s no wonder – with its vast lush gardens featuring meticulous olive tress, its 18 tennis courts, an incredible spa, several excellent dining options and hacienda style accommodation, complete with private patios, fireplaces, hot tubs and more, the retreat appears determined to and more than capable of providing a luxuriously relaxing and reinvigorating retreat. The casitas sit close together on little winding streets, resembling a quaint and serene village. 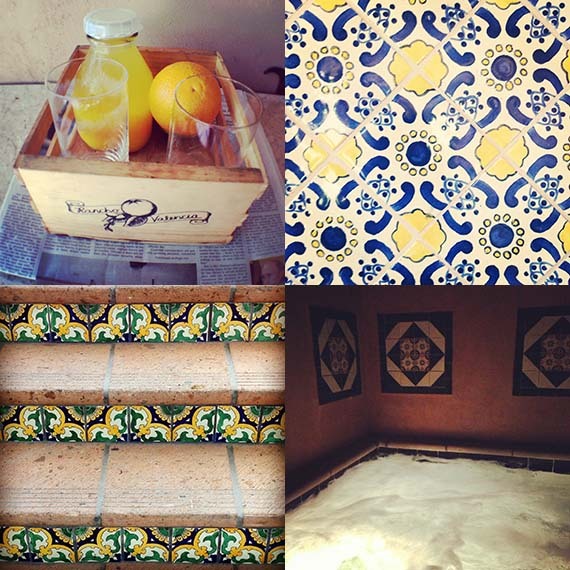 My casita (of the exquisite Valencia Suite variety) is incredible, in size, amenities and décor. The bathroom boasts a separate shower and deep soaking bath tub, double vanity with spa products and a heated Toto toilet seat that provokes a satisfying sigh every time I sit on it. The walk-in closet alone is as big as my bathroom at home and the bedroom and living areas invite a desire to lounge and simmer down, but my favourite part of the suite is the tall walled garden, featuring an outdoor fireplace (perfect for the cooler nights) and whirlpool spa. 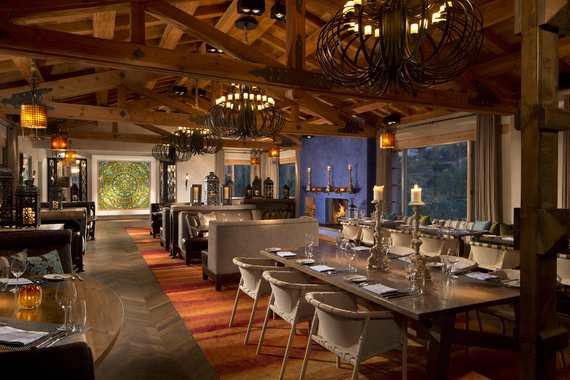 My spa review begins with dinner at the resort’s Veladora restaurant where the wooden beams, elaborate chandeliers, a Damian Hirst butterfly canvas and gently flickering candles lend a resounding warmth, elegance and welcoming tone to the hacienda style setting. My waiter is friendly and eager to share her knowledge of the restaurant’s cuisine (best described as ‘Coastal Ranch’) – I settle for the Slow Poached Lobster Salad and the Crispy Skin Mediterranean Dorade and there begins my delightful foodie experience at Rancho Valencia. The next morning, I’m met with a welcoming delivery of complimentary freshly squeezed orange juice, California oranges and the Los Angeles Times – sometimes it’s the small things that count and this early morning offering is a refreshing and novel treat. Later, I study the delectable breakfast menu at Veladora and deciding what to eat is not an easy task, but as I’m in SoCal, I go for the delicious Huevos Rancheros and (as I’m trying to be healthier) the Wellness Journey Slow Juice. The Sunrise Smoothie too, is an excellent choice as is the Valencia Protein Smoothie that guests are welcome to enjoy post the morning yoga workouts. Motivation to exercise rarely comes easily to me, but at Rancho Valencia I find myself looking forward to the variety of daily yoga classes. The awe-inspiring Serenity Yoga Pavilion sits in front of a purpose built lily-pond and on a floating deck, evoking a sense of tranquility and offering a serene space for exercise and meditation. At my first yoga class at Rancho Valencia, I find myself painfully conscious of my lack of yoga experience but the instructor is quick to put me at ease and the other more seasoned yogis are enthusiastic and sincere in welcoming an amateur. The resort offers a full and varied schedule of activities including, including Spin and TRX, Pilates and Yoga (as well as other mat workouts) and even Tennis. In fact, Rancho Valencia was named the US’ “#1 Tennis Resort” by Tennis Magazine, for the resort’s award winning 18 playing courts including a “main stage” center court with seating. Rancho Valencia’s extensive services also include a tennis clinic where guests of all ages and abilities have the opportunity to improve their footwork and strategy with a team of U.S.P.T.A certified professionals. I like the game of tennis and I like the idea of playing, but I cannot recall swinging a tennis racket around after my early teens. So when I’m offered a tennis lesson with a tennis professional, I excitedly accept, not realising what I’m in for! Todd Nelson, my tennis instructor is a U.S Open and Wimbledon semi-finalist and this information is enough to prompt me to reconsider the lesson and swiftly walk away and hide. But Todd is far from intimidating, and with his gentle and professional guidance I’m quickly feeling confident enough to practice my swing without (a lot of) embarrassment. An hour later, my arms feel like they might fall off, but I’ve gained a newfound enthusiasm for the game of tennis and find myself mentally scouting my nearest tennis courts at home and what type of racket might be best for me. 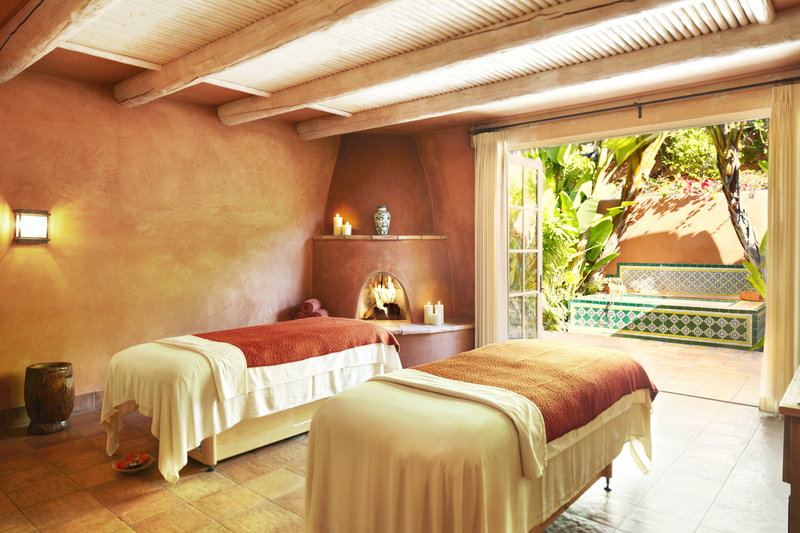 Besides tennis, Rancho Valencia guests also enjoy biking, hiking, croquet and polo in the resort’s vast grounds or for something a little more self-indulgent, the beautiful spa offers a diverse menu of results-orientated treatments. 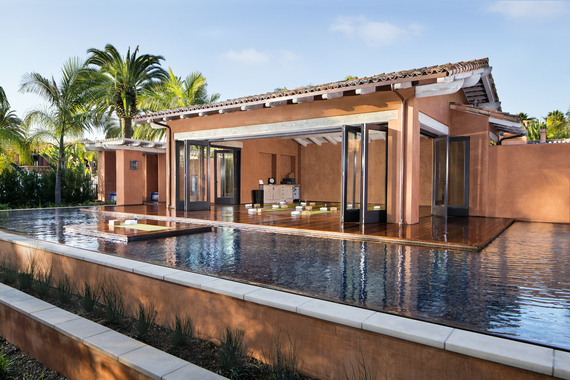 Water features and pools dot the spa courtyards and pretty tiles decorate the pink walls and steps fringed by contrasting plant-life that create a vibrantly serene atmosphere. My Sixth Sense Signature Ritual takes place in one of the spa’s beautifully tiled treatment rooms, with its private patio and outdoor deep soaking tub and rain shower. The treatment commences with a soothing bath soak, which is followed by the most relaxing full body massage using organic Mediterranean Myrtle, Juniper, & organic Jojoba, Avocado & Olive Oils, and to complete the experience, I am treated to a softening hand and foot paraffin wax treatment. Post treatment, I relax in the semi-open spa lounge with some herbal tea, a plate of fresh fruit and a piece of lemon and poppy seed cake. I could happily stay here forever. 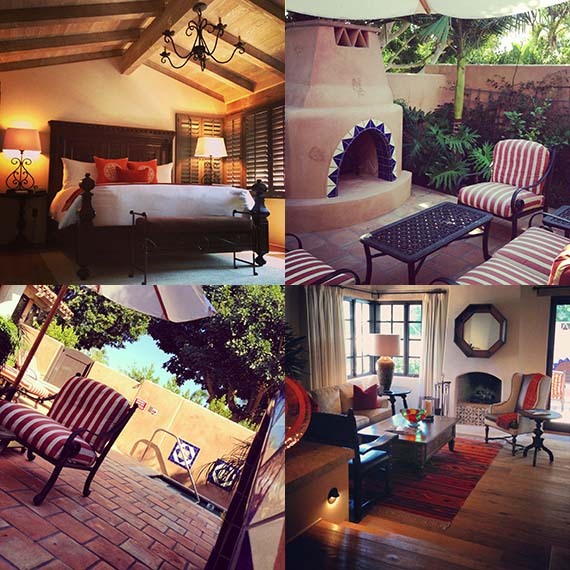 Leaving Rancho Valencia feels like leaving a different dimension, one that embraces you in welcoming and lifts away your worldly troubles and pressures for a time as it enriches you with a new lease of life, as a retreat of its calibre should.